With thanks to Sony Pictures Ireland and Way to Blue, Pop Culture Monster is giving you the chance to win one of 5 cool Battle: Los Angeles t-shirts. 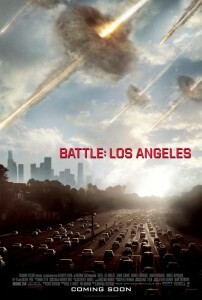 Directed by Jonathan Liebesman and starring Aaron Eckhart, Michelle Rodriguez, Ramon Rodriguez and Ne-Yo, Battle: Los Angeles sees Earth attacked by terrifying and unknown forces with Los Angeles being the epicentre of it all. It’s an all-out action flick with aliens and big machines. To be in with a chance to bag yourself one of the cool tees, all you have to do is answer the very simple question below and you’ll be entered into the draw. Q: Aaron Eckhart played which villian in the 2008 film The Dark Knight? Answer a, b or c with your name below in the comments. Competition closes Monday 28th February. Open to Irish residents only.